Newsletter Design Services | New Design Group Inc.
New Design Group comprises a skilled team who can create newsletters to appeal to your target market, depict you as a highly professional and trustworthy organisation, and help you make more sales. 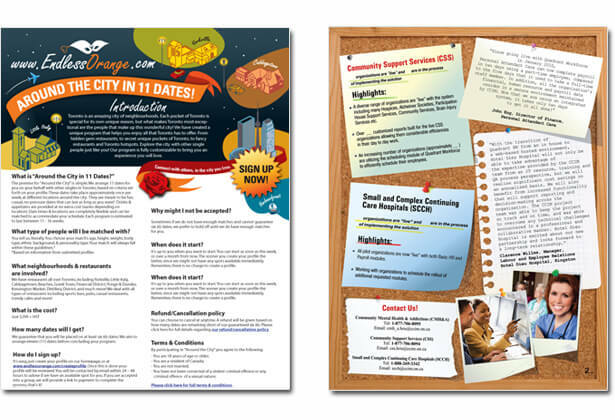 Whether you want a simple newsletter to email to your database or require a more substantial newsletter to be professionally printed, we have the expertise to create just what you need. Our team includes not only exceptional graphic designers but also communication experts – people who know how to write content to suit the media it is to appear in. Newsletters are meant to be read. This doesn’t mean they need to contain pages and pages of dense text: far from it. The less cluttered the text the easier it is to read; the more appealing the content, the more the reader will be hooked; and it goes without saying that poor grammar in a newsletter – printed or electronic – is completely unacceptable. Electronic newsletters have to be specifically designed with the internet user in mind – many people are bombarded with e-newsletters so if they don’t like the look of one, they’ll simply ignore it. Our team know how to create professional looking e-newsletters with ‘taster’ paragraphs and attractive imagery that encourage the reader click through to read more on the website, to sign up for more information or to place an order. 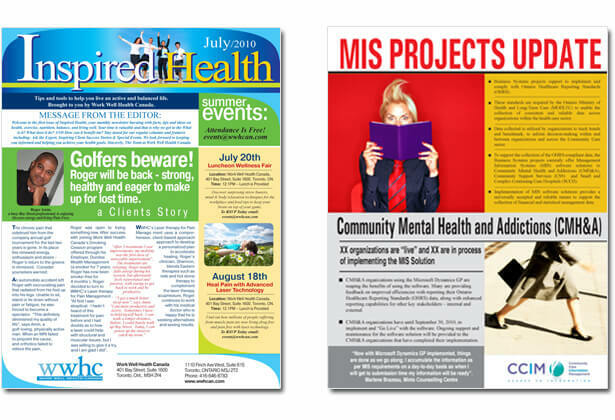 In addition we can create top class traditional printed newsletters. We understand that the front page should have a prominent image which accurately depicts what the main feature is about and a typeface which complements the overall style of the publication. In the interior, the overall layout should comprise well spaced out text and carefully placed images – all designed to lead the reader easily through each article and onto the next. To keep the reader hooked, little variations can be used to break the monotony of reams of text – catchy quotes in small boxes or client feedback alongside a photo of the person in question. Whether a newsletter is being distributed via email or is being printed in hard copy, it should always look professional if it is to be read and enjoyed by customers, if it is to create a positive impression of a company and if it is to generate more sales. Our electronic will help you get more website traffic and increase sales; our printed newsletters will impress clients and encourage them to turn to you to meet their needs – so simply call us on 647 271 7463 if you need a newsletter than brings you positive results.